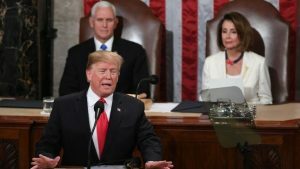 President Trump delivered one of the best speeches of his presidency last night, weaving together aspirational rhetoric with raw, emotional personal stories, as well as a focus on key issues of deep concern to Catholics. A snap CNN poll showed that 76% of viewers approved of what President Trump said. And according to CBS, 72% agreed with what he said on immigration — his signature issue. Here are Five Reasons why President Trump’s speech might be the most “Catholic” State of the Union we’ve ever heard. The roar of applause from the House chamber still gives me chills. The bean counters at the Wall Street Journal probably didn’t like it, but President Trump called for nationwide paid family leave “so that every new parent has the chance to bond with their newborn child.” He’s right to do so. The birth rate in the United States just hit a historical low. But President Trump didn’t stop there. He also made a plug for school choice to help working parents. And then noted that his recent tax reform bill doubled the child tax credit. Most importantly, he touted the historic economic success now underway in America, including record-low unemployment among African Americans and Hispanic Americans — and rising wages. If the best poverty program is a job, then President Trump has every right to brag. Catholics are often conflicted on the President and immigration. But data suggests they’re more troubled by his rhetoric than his policies. Last night, the President did far more to advance immigration reform than months of frustrated tweets and a government shutdown have accomplished. No wonder Americans liked it so much. One thing that has united both Democrats and Republicans in the Beltway has been support for continued military action in Afghanistan and the Middle East. It’s been the story of U.S. foreign policy in the 21st century — despite clear warnings from St. Pope John Paul II and Pope Benedict XVI. Trump has surprised many observers by avoiding new military engagements. He has resisted an extended intervention in Syria. In fact, he’s trying to get our troops out of that country. And he’s pushing for a peace process that could finally bring many of our troops home from Afghanistan — a war we’ve fought for almost 18 years. And on trade, the President deserves credit for leading a new push to rebalance our trade deficits with countries like China. The data is growing. Americans have traded away quality jobs and a robust manufacturing base in exchange for cheap products, a working class mired in drugs, social disruption, and massive income inequality. No quick tariffs or modified trade agreements will fix these problems overnight. But it’s high time our leaders address the causes and have the guts to begin fixing them. In rejecting socialism, President Trump didn’t embrace a ruthless hyper-capitalist view focused exclusively on efficiency and GDP. Trump’s goals are clear: he wants to rebuild the middle class by investing in infrastructure, securing our border, incentivizing manufacturing, and putting the American family first, including the unborn. He urged unity, cooperation, compromise and…the common good. 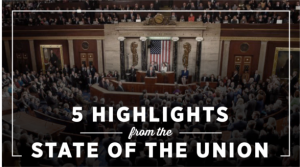 A Catholic State of the Union speech? P.S. “5 Reasons” is always a fun compilation. However, I can’t help but mention a sixth reason for Catholics to applaud the President last night– one that even President Trump didn’t mention. Sitting in the chamber last night were Justice Neil Gorsuch and Justice Brett Kavanaugh. Two constitutionalist judges who will serve for decades. I guess that’s reasons six… and seven! PAID FOR BY CATHOL?ICVOTE.ORG. NOT ENDORSED BY ANY CANDIDATE OR CANDIDATE’S COMMITTEE. Associated Press and the “main stream” media did not give President Trump credit for this outstanding presentation. President Trump was at his best in this speech. Even biased media polls confirm the accomplishment. Pelosi’s biggest criticism was that he did not address gun control. People need to stand back for a while, especially the Dems’s and see what this guy can do for the next two years. God Bless President Trump. His speech said it all. He took on many of the problems destroying our nation today and did it with grace and heartfelt concern. I believe that God has given us President Trump to help guide our country back to His Commandments, morality and civility. I pray the Lord will once again Bless our great country through President Trump. May the Lord protect and guide our President, and defeat the forces of evil that plague our nation.